Welcome to Jennifer’s cooking and eating blog! ← For my first post, how about some TIPS on ingredients? This recipe was inspired by my favorite food blog, and new favorite cookbook, Sprouted Kitchen (blog: http://www.sproutedkitchen.com/; cookbook: http://www.amazon.com/The-Sprouted-Kitchen-Tastier-Whole/dp/1607741148). The blog and cookbook are wonderful combinations of tasty food, healthy ingredients, and manageable preparations. This side dish was especially tasty. 1. 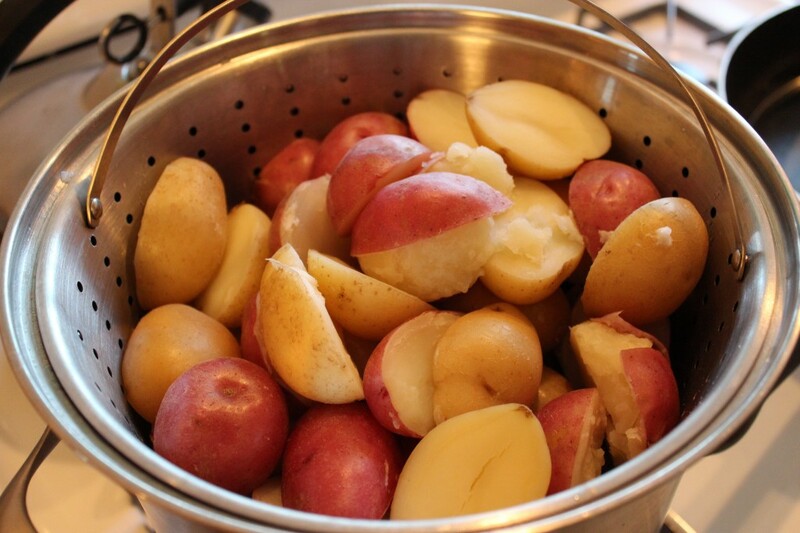 Wash the potatoes, cut them in half, and boil with 2 teaspoons salt for about 20-25 minutes until they are tender. Drain and place back in the pot. 2. While the potatoes cook, remove the kale leaves from the thick ribs. Discard the ribs and chop up the kale into bit sized pieces. Mince the three cloves of garlic. 3. Heat 1 teaspoon olive oil over medium heat and cook the garlic until it is fragrant and softened, about 2-3 minutes. 4. Add the kale, cooked garlic, and remaining olive oil to the potatoes. Mash all together. 5. Add the parmesan, buttermilk, horseradish and salt and pepper to the potato/kale/garlic mixture. Mash again (or mix as needed). 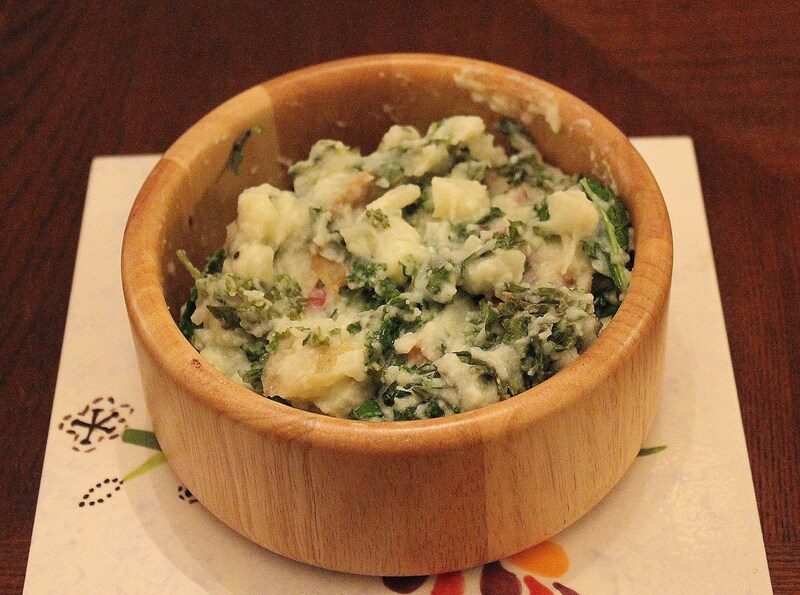 This entry was posted in Mains, Sides and tagged Gluten Free, Kale, Potatoes, Vegetarian. Bookmark the permalink. Do you think you could substitute Greek yogurt for the buttermilk if you thin it down a bit? I often don’t have buttermilk but always have Greek yogurt. I bet it’d give the same twangy taste, but could save a trip to the store… Any tips? I definitely think Greek yogurt or low fat sour cream would be a great addition to this recipe instead of buttermilk. 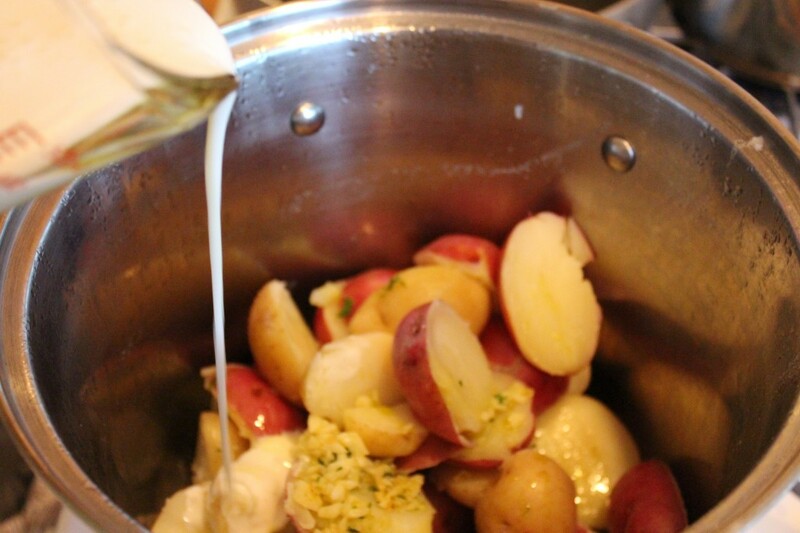 However, I would probably thin it down a bit, not only for “thinness” purposes, but also because the potatoes are better when they have a little liquid to absorb, so a combo of Greek yogurt and milk would be perfect consistency and add a nice tang. Great suggestion, thanks!